Welcome! My name is Kait, and I’m the Owner and Instructor at Wyoming Paint and Create. I founded Wyoming Paint and Create to do something I’ve always wanted to do; combine my love of teaching with my love of art! (Okay…Okay..and the occasional glass of wine!) I truly believe that anyone can be an artist. Wyoming Paint and Create is designed to be a fun and different kind of night out. Bring your friends, family, significant other, anyone! Come and enjoy all that Wyoming Paint and Create has to offer! Or…Better yet, let us come to you! If you ever have any suggestions of a painting you would like to see, let me know and I will try my best to incorporate your vision or idea into a painting. Thanks for visiting, and I look forward to helping you find the artist in yourself! Kait is the owner and instructor at Wyoming Paint and Create. She currently teaches junior high math, has run an after school art club for students grades 5-8 for the past five years, and thoroughly enjoys her work as an educator. Kait grew up in the suburbs of Chicago where she studied education at Southern Illinois University. Kait taught ceramics all throughout college, and found a love for all forms of art whether it’s ceramics, origami, knitting, crocheting, or painting. After graduation, she applied all over the country and eventually landed in Wyoming. Kait fell in love with the Wyoming lifestyle, and after four years in the cowboy state met her fiancé, Erick. She enjoys working out, hiking, crafts (Of course! ), trashy reality TV (..because who doesn't?) 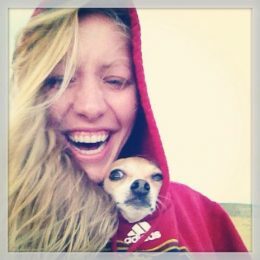 and possibly more than anything…her dog Winnie. Erick is Kait’s Fiancé, and considers himself to be the luckiest guy in the world to have her in his life. Erick created the website, marketing plan, and all of the graphic design for Paint and Create, and helps Kait at events whenever he can. He is an award winning Sports Director at The Wind River Radio Network, and the voice of The Riverton Wolverines and Riverton Raiders. Erick has been a small business owner for over 10 years, running a mobile DJ service for weddings, school dances, and more. 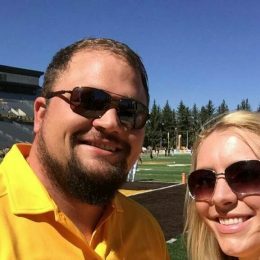 A former Wyoming Cowboy football player, Erick spends his free time watching all things sports, shooting archery, and mountain biking.